With HydraBoost. Body & bounce. Free of: sulfates, parabens, phthalates, gluten, drying alcohol and artificial colors. 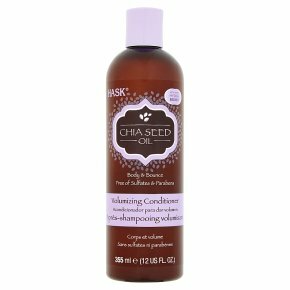 Not tested on animals.A weightless complex to help create fullness that speaks volumes Get instant body and bounce with Hask Chia Seed Oil Volumizing Conditioner. Cultivated in South America, the tiny seeds of the chia plant are known to be enriched with hair-volumizing proteins, antioxidants and shine-enhancing nutrients like omega-3s. Our weightless, hair-plumping formula with HydraBoost conditions every strand with extra luster and lift - and no frizz! Directions: Apply to wet hair. Leave on for 1-2 minutes. Rinse thoroughly. Ideal for daily use. For best results, use the Hask Chia Seed Oil collection.